Standing by my photographs included in the Exhibition, "Women's Show +2" at MORA (Museum of Russian Art). 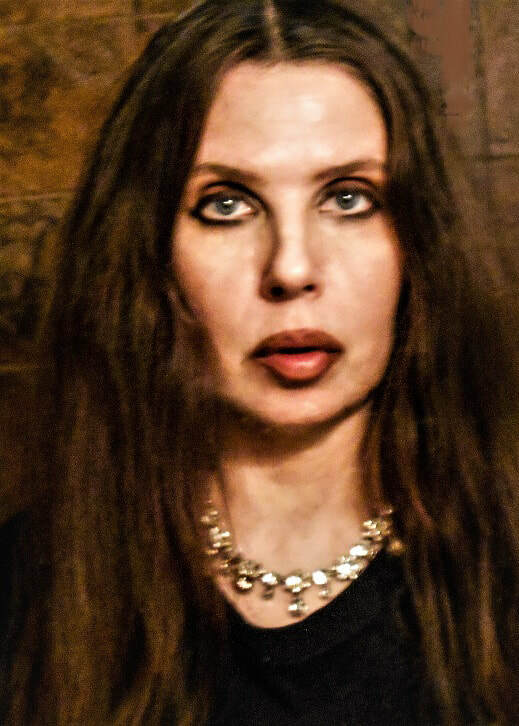 "Welcome fellow artists, art lovers, and anyone interested in getting to know my creative process as an artist and the unique individual that I am. You are invited to relax and take refuge in this little corner of the internet where I hope you will enjoy viewing both the creative process and my finished pieces of artwork. It is my desire to create images that inspire the artistic mind!" Standing on the front steps of MORA (Museum of Russian Art) where I have exhibited my artwork. SLIDE SHOW OF MY ART WORK! Click on photo for a "link" to pictures from the show! 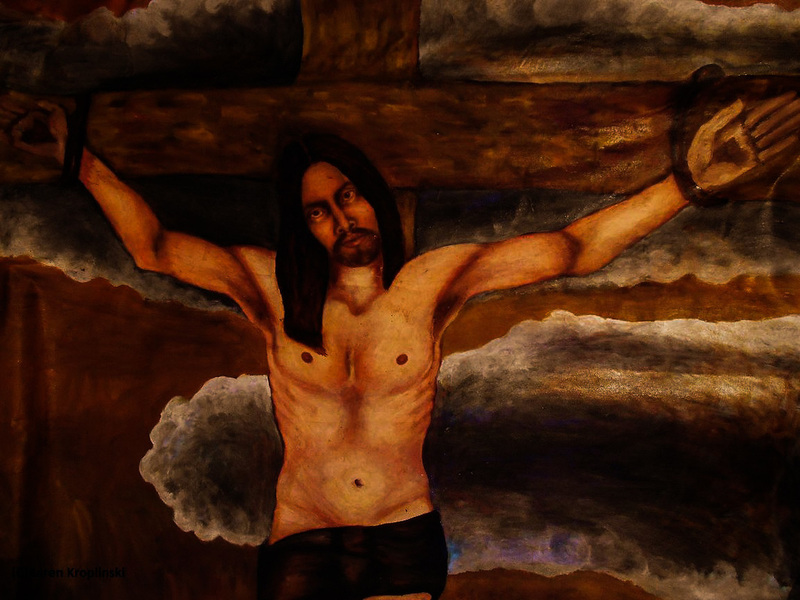 "Crucifixion", Karen Kroplinski, Oil on Canvas, 6ft.x10ft. "I try to give a spiritual quality or essence to my work. This spirituality enables my artwork to 'speak' to the viewer and 'feel' the emotion within it. One must not merely 'look' at or even 'imagine' a subject and paint it, but 'feel' its emotion......live it, breathe it, become it! My artistic ability comes from God. And from God, my artwork is created. I connect with the flesh and blood of Christ on a spiritual level and it is in this higher spiritual plane that I create my art. I create art and I live, or I don't create art and I suffer!" 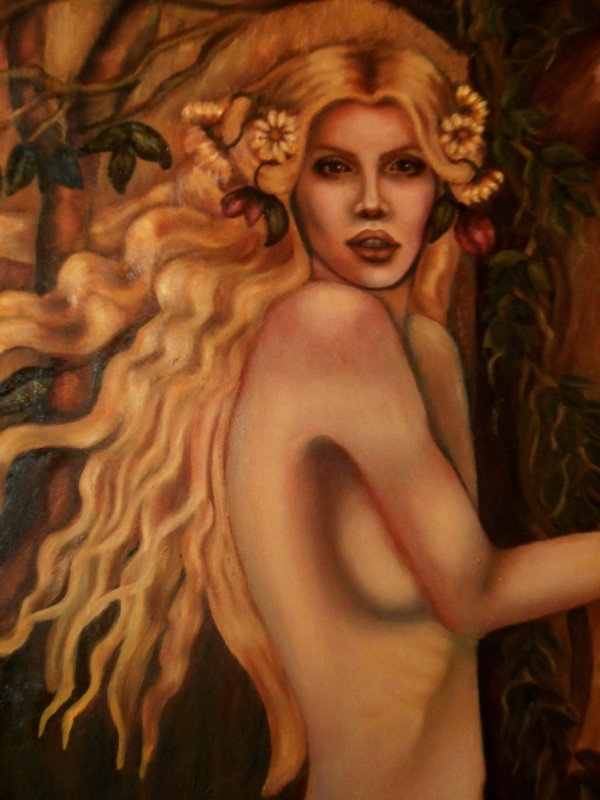 "MADONNA", Karen Kroplinski, Oil on Canvas, 30"x40"
"In my studio, the hours fly by past midnight as I paint and I am transcended into another world....another reality....my art!" "I will finish my painting by the submission deadline if I have to paint it in my own blood!" Detail, "The Desolate One", Oil on Canvas, 24"x24"
"As Artists we 'feel' things more than other people. Our joys ignite us with the fire of life! Our sufferings try to devour our souls and send us to the pit of hell! In the end, these emotions become our art! Come and join me on a journey of self-discovery and spirituality!" 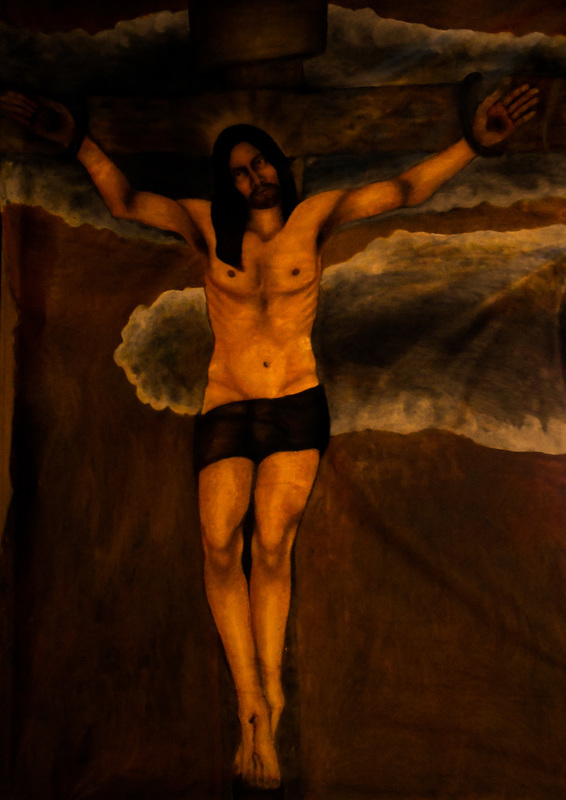 "SACRIFICIAL LAMB", Oil on Canvas, 84"x60"
Before the time of Christ, it was believed that atonement for sin could be achieved by the sacrifice of a lamb. This painting depicts this belief. In my painting, "SACRIFICIAL LAMB" the young woman stands on the edge of a cliff, ashamed of her sins of the flesh ready to slaughter and sacrifice a lamb. 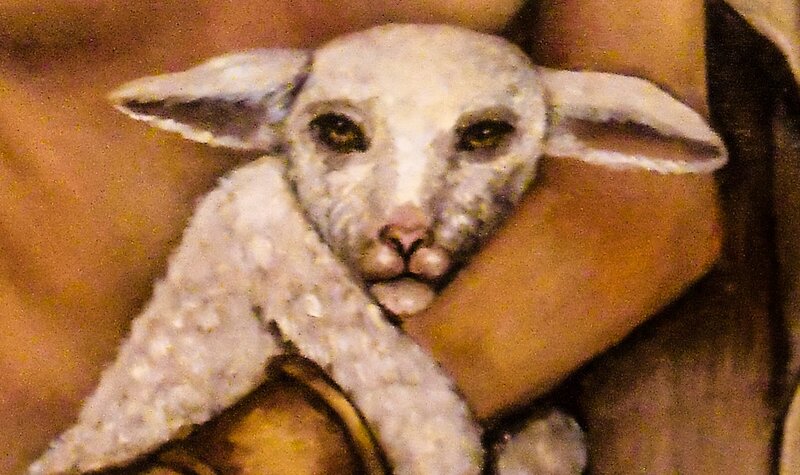 Working til 5AM on my latest oil painting masterpiece, "SACRIFICIAL LAMB"! Finishing touches on my oil painting masterpiece, "SACRIFICIAL LAMB"! MORE VIDEOS OF MY ART! VIEW "BAPTISM OF A REPENTANT SINNER"! 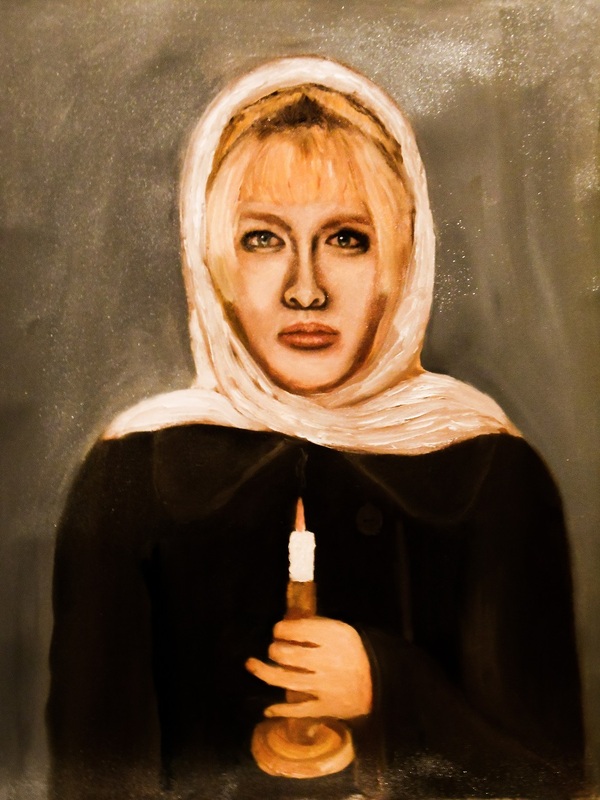 VIEW MY OIL PAINTING MASTERPIECE, "SACRIFICIAL LAMB"! 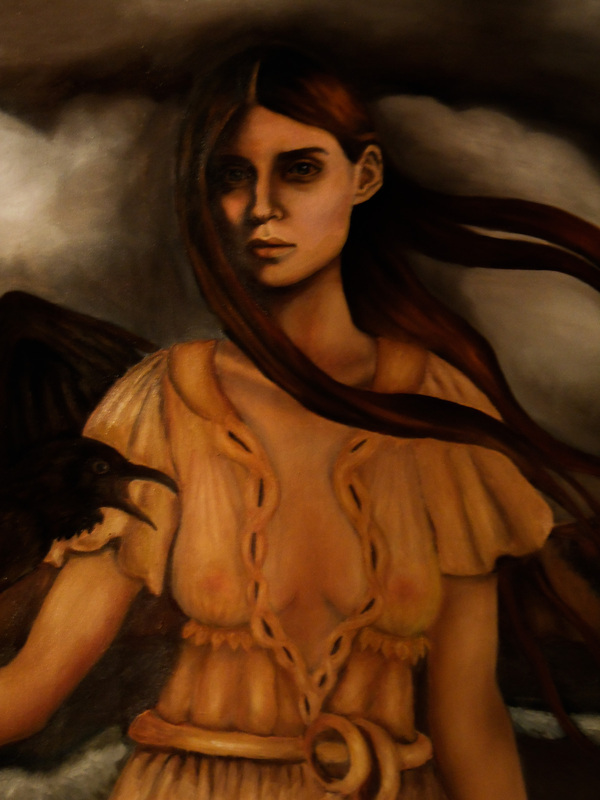 VIEW MY HAUNTINGLY BEAUTIFUL OIL PAINTING,"THE RAVEN" IN MY STUDIO! 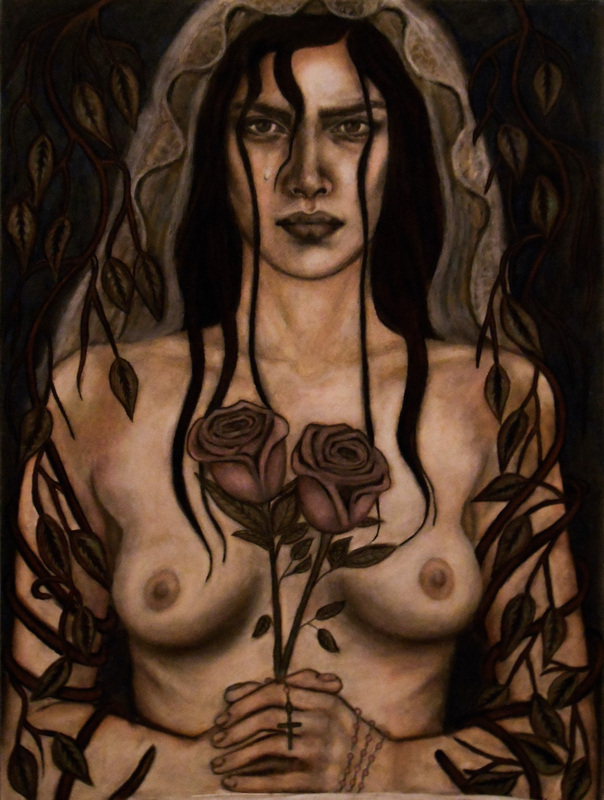 MY OIL PAINTING, "EVE IN EXILE, EXPULSION FROM THE GARDEN OF EDEN", VIEWED IN DETAIL ALONG WITH MY BEAUTIFUL, RELIGIOUS PAINTING "CRUCIFIXION"! THE "MEANINGS" BEHIND SOME OF MY ARTWORK! 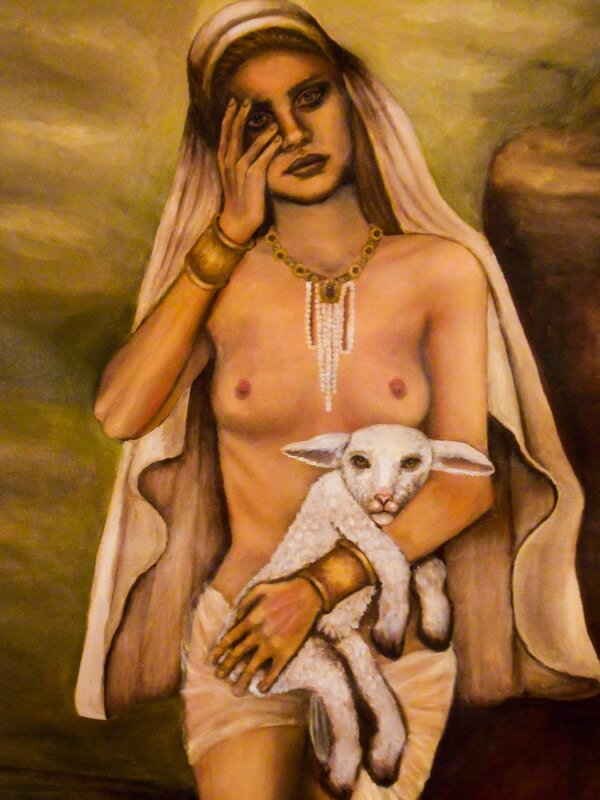 Various images of my oil painting masterpiece, "SACRIFICIAL LAMB"
Before the time of Christ, people believed that atonement for sin could be achieved by the sacrifice of a lamb. This painting depicts this belief. 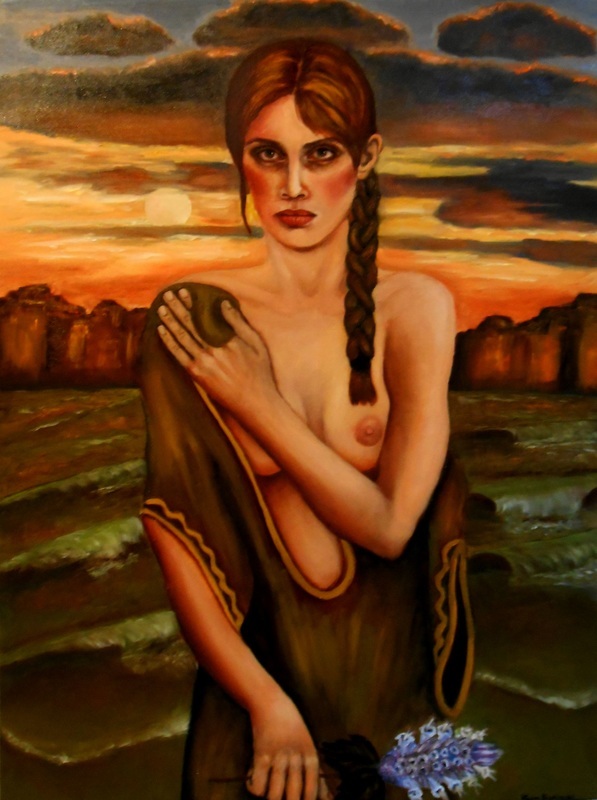 In my painting "SACRIFICIAL LAMB", the young woman stands on the edge of a cliff, ashamed of her sins of the flesh, ready to slaughter and sacrifice a lamb. "LOVE AND DEATH", Oil Pastel, Colored Pencil, Charcoal, and Graphite on Paper, 18"x24"
The spiritual realm, the physical realm, a separation, a "veil" between those two types of existences.......and for some that means separation from those we love. I explore this idea of spirituality and longing for the one we love in this work of art that I call "LOVE AND DEATH" This separation can be from actual "PHYSICAL DEATH" or the physical "separation" from those we love for ANY reason and the horrible, sad emotions of feeling "bound" and unable to do anything about it. We are in a state of "physical" separation from those we love, but a "spiritual" connection can still remain. VARIOUS IMAGES OF MY OIL PAINTING MASTERPIECE, "THE RAVEN", 57"x66"
My painting "THE RAVEN", explores a woman's longing for the "spiritual world" while she is still in the "physical" world. 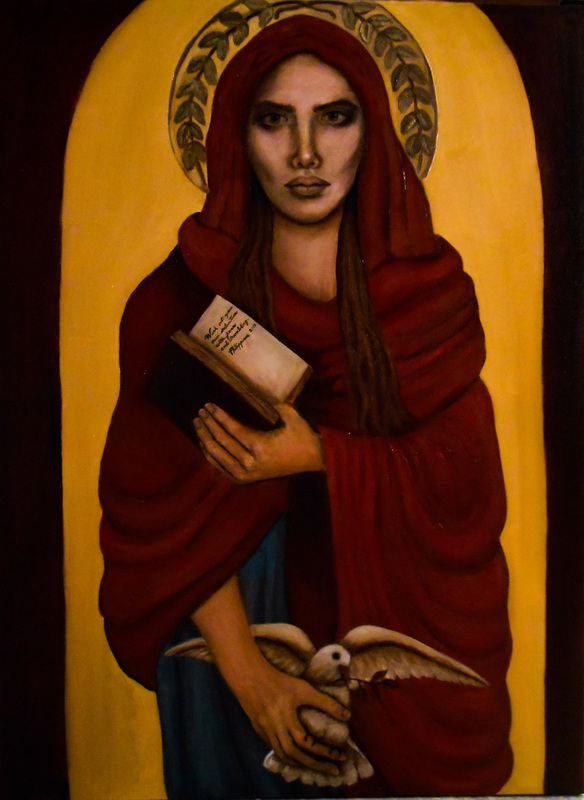 In this painting, the raven represents "death" as the woman contemplates the spiritual world. Her devotion to God is depicted in her clutching of her rosary beads. 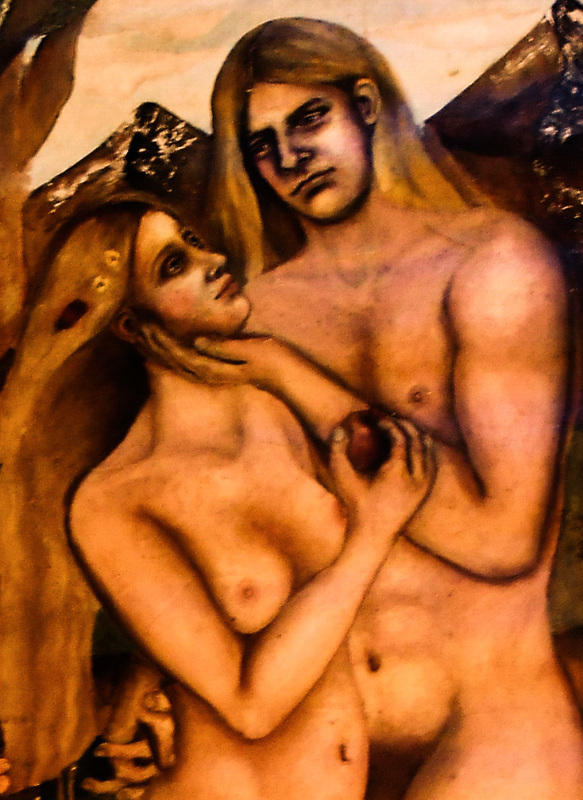 Eve feels desolate and disoriented after being expelled from the Garden of Eden. 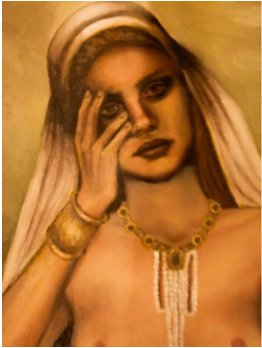 SCROLL DOWN TO SEE MORE OF MY BEAUTIFUL, SPIRITUAL PAINTINGS, DRAWINGS, AND PHOTOGRAPHY! Hi! I'm artist Karen Kroplinski and glad you could join me for breakfast at this website while exploring the images of my artwork that I have displayed here. So sit back! 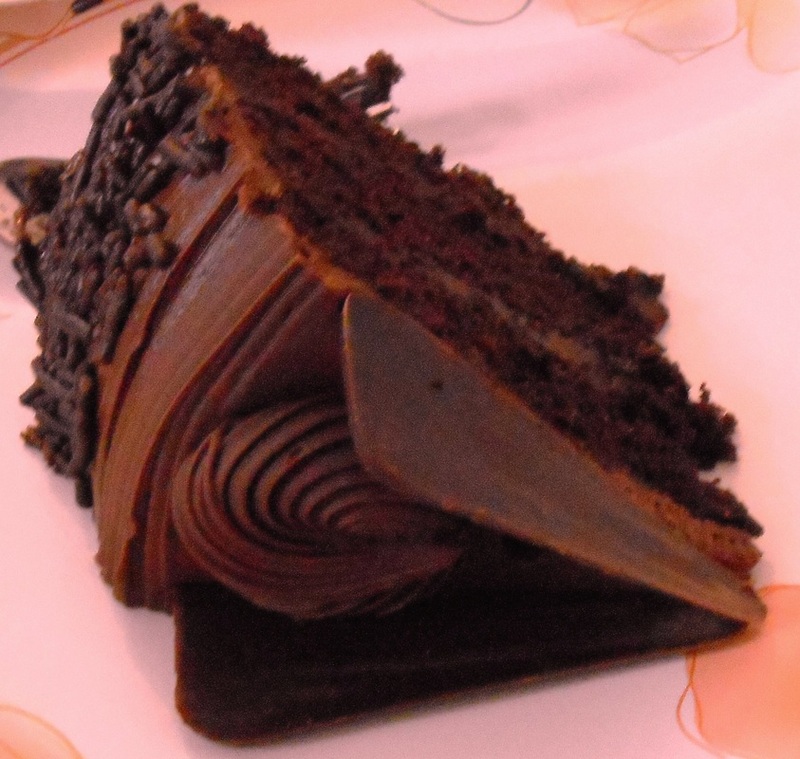 Have a nice big cup of coffee, tea, or a tall glass of fresh milk with some fancy Chocolate Cake and relax and enjoy! DRAWINGS, & the "meanings" behind them. "FIONA," Graphite on Paper, 18"x24"
DETAIL/DRAWING/SKETCH, Charcoal/Graphite on Paper, 18"x24"
DRAWING, "THE ANGEL", Karen Kroplinski, Charcoal/Graphite on Paper, 18"x24"
On the morning of 12/12/12, I had a dream, or "vision", of an Angel. The Angel came to me as a DRAWN IMAGE in the night sky. The Angel tried to relate to me by showing me various paintings and artwork. The Angel then spoke to me and said, " A TERRIBLE RECKONING COMES BEFORE THIS MESSAGE!" The Angel then spoke to me about things I either don't remember or did not understand. As the Angel spoke to me it came closer and closer. The last thing the Angel said was, "FAREWELL", as if to mean "be well" as opposed to farewell meaning, "goodbye". I could FEEL an immense SPIRITUAL ENERGY emanating from the Angel as it came closer to me until it actually went right through me. I do not understand the MEANING behind this MESSAGE. This drawing I present to you comes as close as possible to the image of the Angel that I saw in my dream. I call it "THE ANGEL". UPDATE: I believe that I now possibly understand at least part of the "Angel's" "TERRIBLE RECKONING" message. Unfortunately, I think the Angel was forewarning me of a family member becoming ill. This MAJOR, unfortunate event has been one of the most terrible things that has occurred in my family. After this dream or "vision", I came upon an Angel "COIN" when trying to find change for the parking meter when driving out to the place that (not known to me at that time) was right next to the Hospital that I would be visiting my ill family member for many days! Had it not been for this initial journey out to this area, I would have had difficulty finding where the Hospital was in order to visit my family member at a moments notice and make sure she was alright there. I actually came upon another Angel "coin" not long after the first one, when again, going out to the area that would be next to the Hospital! I realize now, that it was the Angel.....and God.... helping me to find this area! It was ME who would ultimately be responsible for taking care of my family member in her time of need! AND....THIS....I THINK, WAS THE "TERRIBLE RECKONING"!!!!! Karen Kroplinski, Graphite on Paper, 18"x24"
This drawing was done while I was evacuated during Hurricane Sandy. Most of which was accomplished in a dark room lit only by a flashlite since we had lost power! The drawing interprets how I felt about the hurricane and the utter "Spiritual" control that Nature has over the environment and humans in it's unrelenting, unleashing of the Four Elements, (Earth, Air, Fire, &Water)! DRAWING "SPIRITUAL METAMORPHOSIS", Karen Kroplinski, Graphite on paper, 18"x24"
Imagine for a moment that one of natures greatest, most amazing animals, the Grizzly Bear, has wandered close to you. Imagine the terrifying feeling when that bear starts to run towards you! 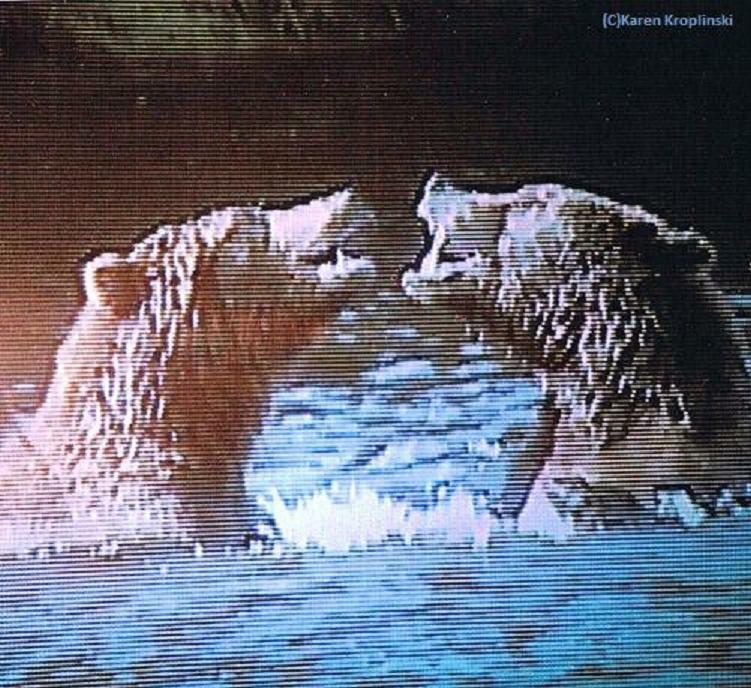 This actually occurred on a trip to Alaska with my mother, although it was possible to avert the danger of the bear by getting off the trail and into the brush. Alaska is an amazing place full of beauty and nature and this trip forever changed me and the way I look at bears, nature, and Alaska. I felt "spiritually" transformed by this trip. A "Spiritual Metamorphosis" that made me feel at one with the bears, and at one with nature in Alaska. This drawing I present to you manifests this experience into a work of art. I call this drawing, "SPIRITUAL METAMORPHOSIS". DRAWING, "EVE'S TEMPTATION IN THE GARDEN OF EDEN", Karen Kroplinski, Graphite on paper, 18"x24"
DETAIL/DRAWING, "THE CHRIST", Karen Kroplinski, Graphite on Paper, 9"x11"
DRAWING, "STIGMATA", Karen Kroplinski, Charcoal on Paper, 18"x24"
ARTIST, KAREN KROPLINSKI: The substance, the purpose of my art comes from within....the spiritual, religious, unearthly realm where my soul connects with Christ and my art is the result. "CLICK" ON PICTURES FOR LINKS TO OTHER PAGES! 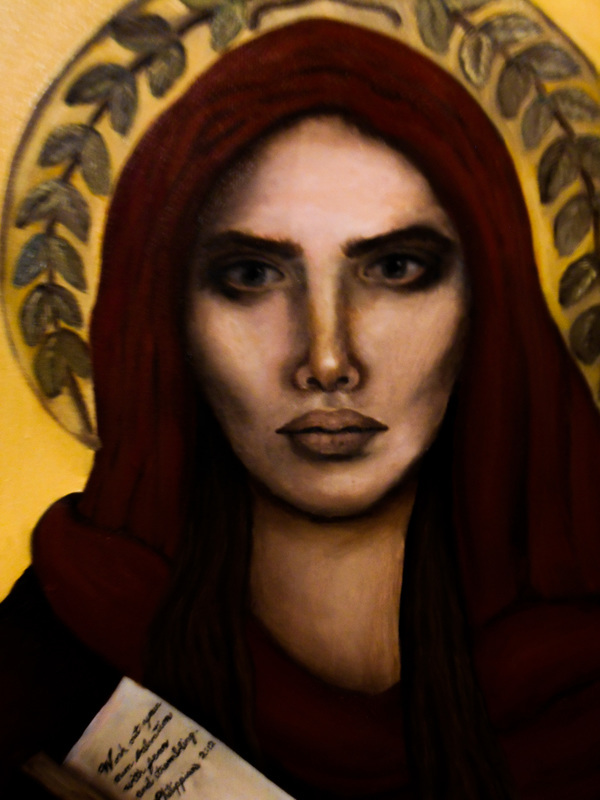 "The Desolate One", Oil on Canvas, 24"x24"
" ​"Madonna", Oil on Canvas, 30"x40"
"Baptism of a Repentant Sinner", Oil on Canvas, 30"x40"
"Baptism of Repentant Sinner", Oil on Canvas, 30"x40"
Detail, "SACRIFICIAL LAMB", Oil on Canvas, 84"x60"
"THE RAVEN", Karen Kroplinski, Oil on Canvas, 57"X66"
DETAIL FROM MY OIL PAIINTING MASTERPIECE, "THE RAVEN". 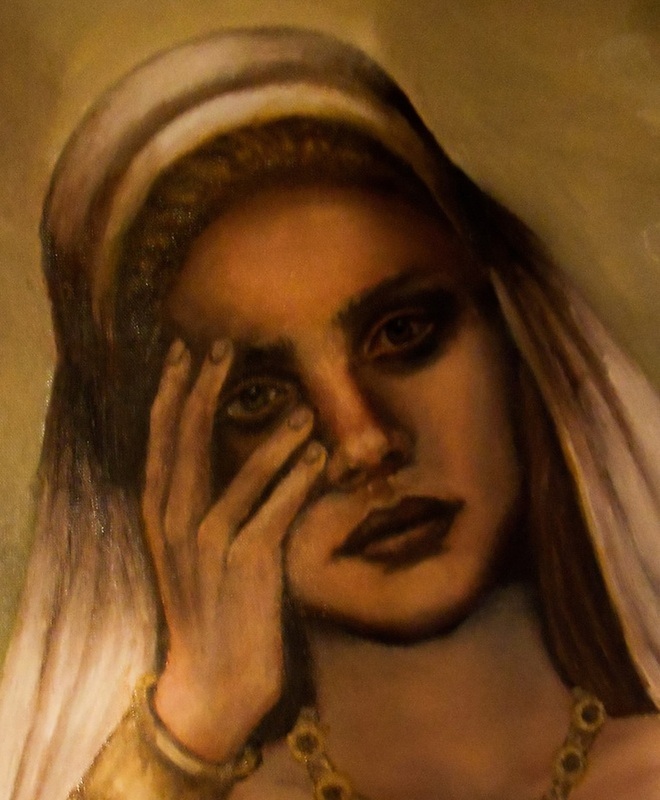 Oil on Canvas, 57"x66"
DETAIL, "THE RAVEN", Karen Kroplinski, Oil on Canvas, 57"x66"
"Eve in Exile, Expulsion From the Garden of Eden", Karen Kroplinski, Oil on Canvas, 6ftx4ft. Karen Kroplinski, Oil on Canvas, 6ftx4ft. 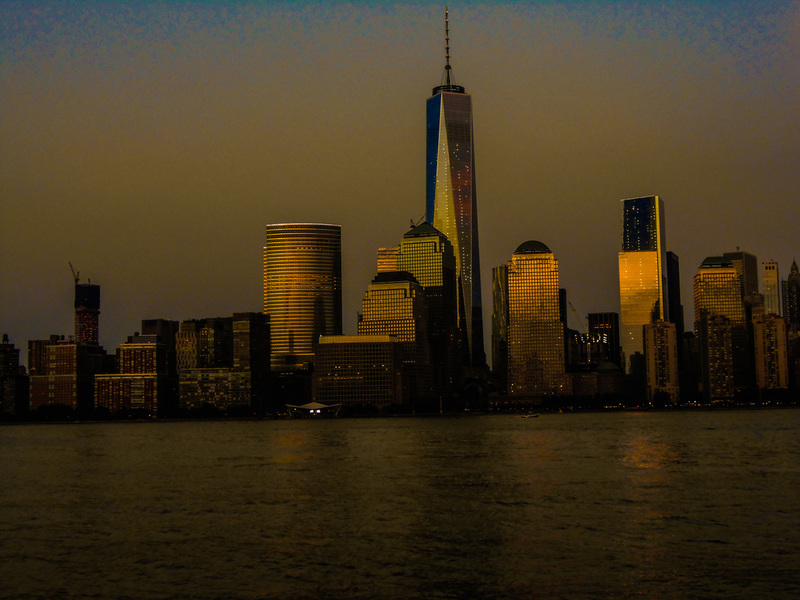 "TWILIGHT TOWERS" PHOTOGRAPHIC SERIES! CLICK ON PICTURE FOR LINK TO MORE IMAGES! 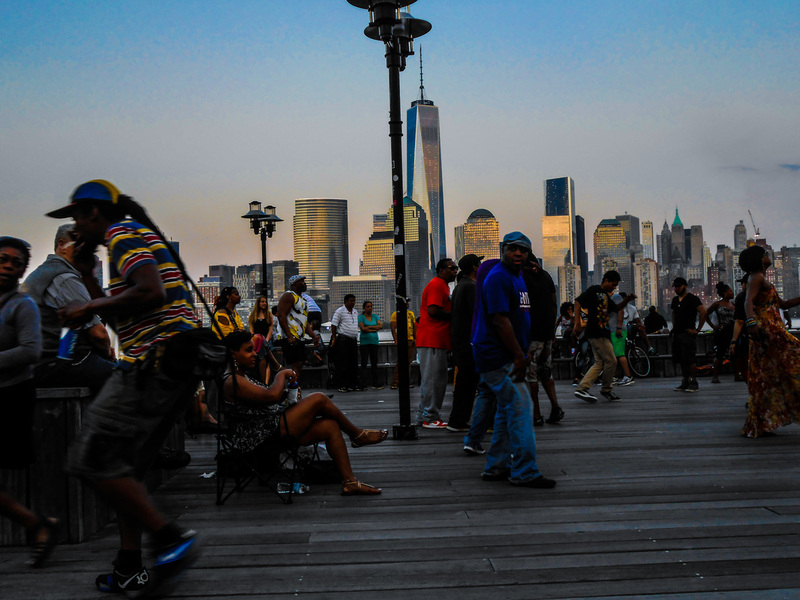 "DANCING TO THE NYC SKYLINE" PHOTOGRAPHIC SERIES! CLICK ON PIC FOR LINK TO MORE IMAGES! 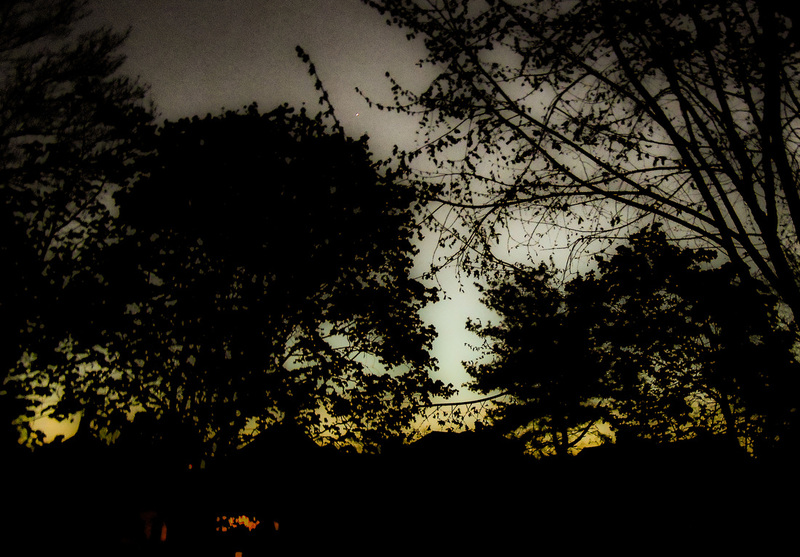 "TWILIGHT TREES" PHOTOGRAPHIC SERIES! CLICK ON PICTURE FOR LINK TO MORE IMAGES! "JEWELED GODDESS" PHOTOGRAPHIC SERIES! CLICK ON PICTURE FOR LINK TO MORE IMAGES! 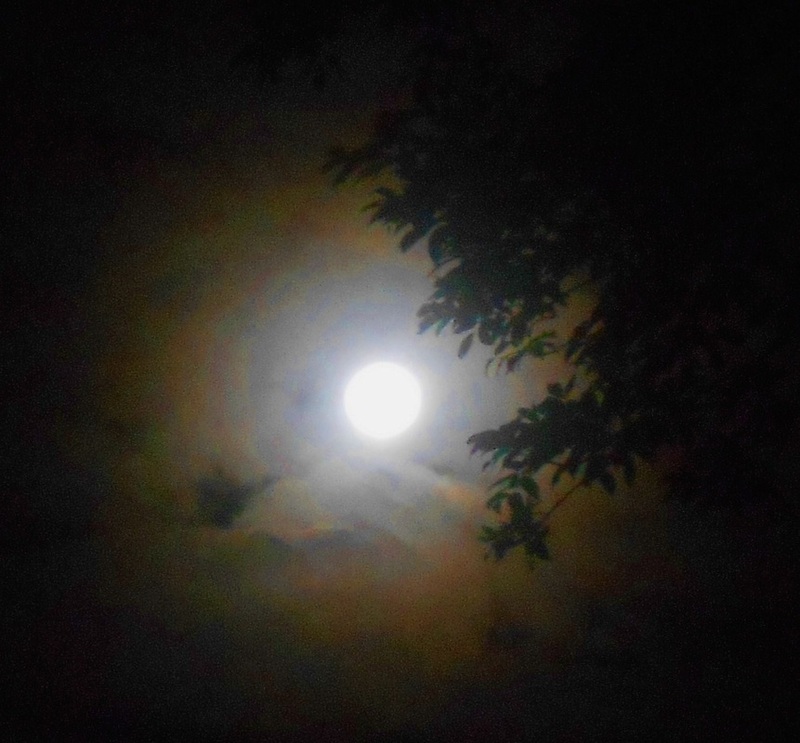 "NIGHT MOON" PHOTOGRAPHIC SERIES! CLICK ON PICTURE FOR LINK TO MORE IMAGES! 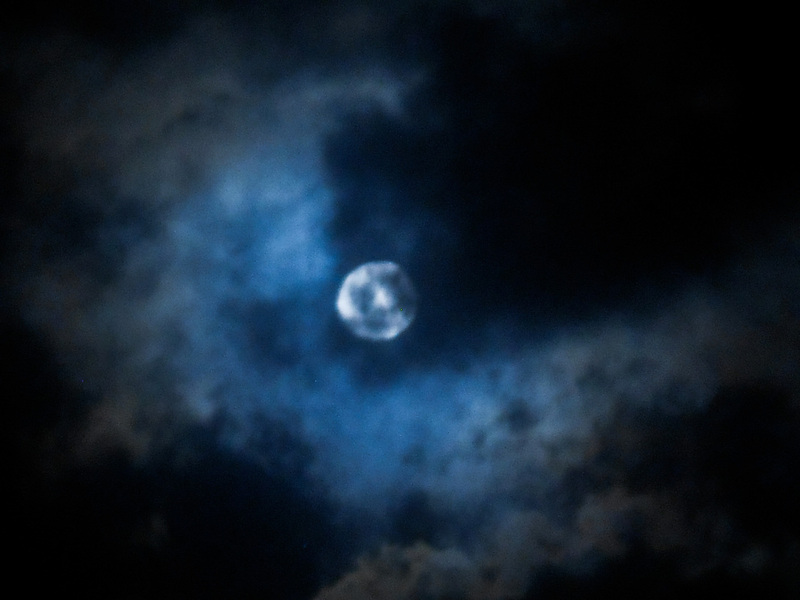 Photograph from my "NIGHT MOON" series in the "Photography" section under "My Work". "THE RAVEN" PHOTOGRAPHIC SERIES! CLICK ON PICTURE FOR MORE IMAGES IN THIS SERIES! 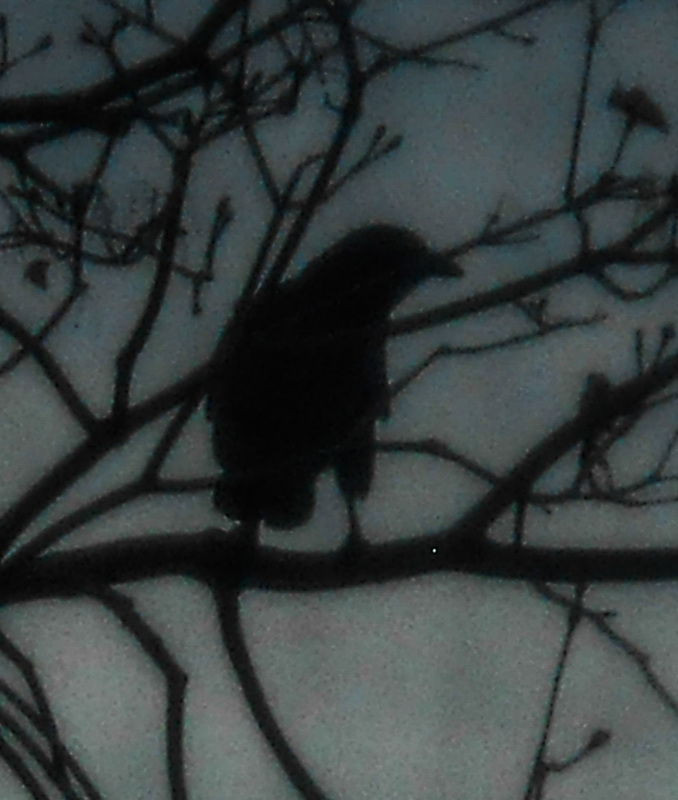 PHOTOGRAPH TITLED, "RAVEN". ONE IN A SERIES OF PHOTOGRAPHS I TOOK! 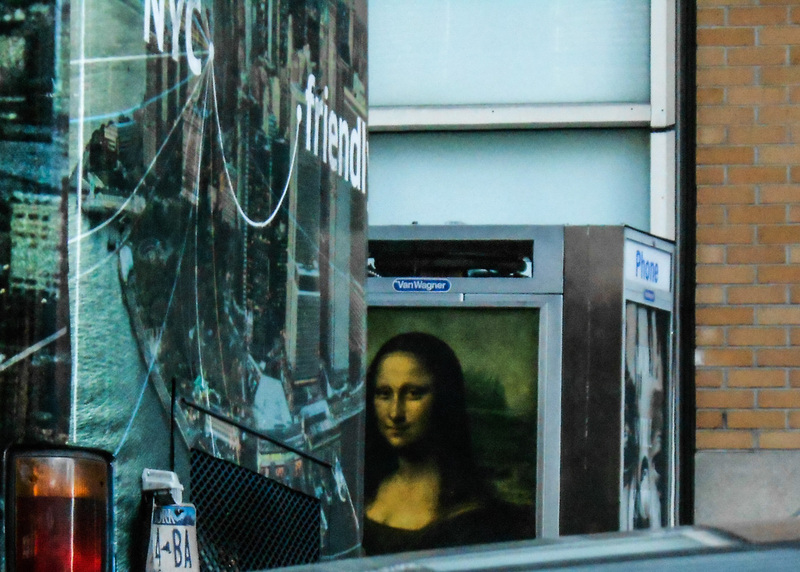 Photo from the "Astral & Outdoor Photography" section under "My Work"
Photograph I took from a trip to NYC in the "NYC Photography" Section under "My Work". 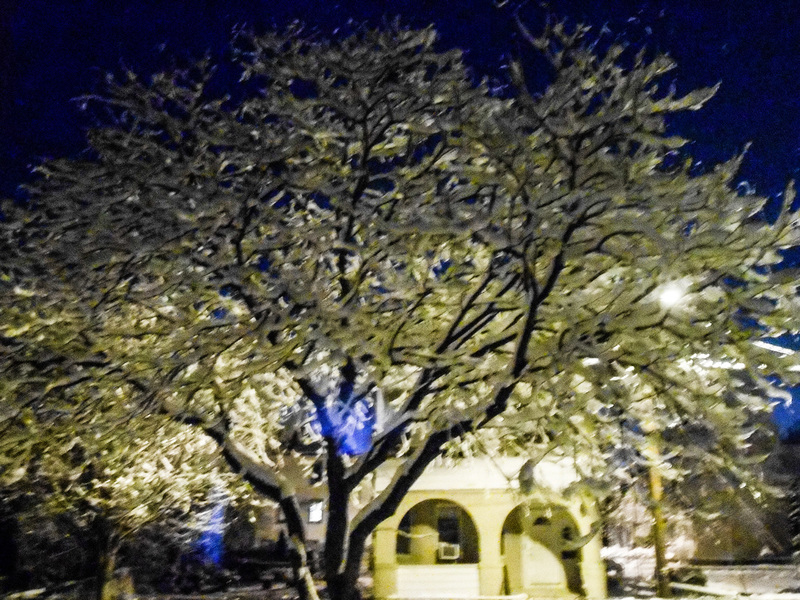 All images on this page, except the Heading Title photograph on this page, are © copyrighted by Karen Kroplinski 2019, All Rights Reserved. Do not reproduce without written permission. Any rights not expressly granted herein are reserved.